Get ready for a wet and wild time! 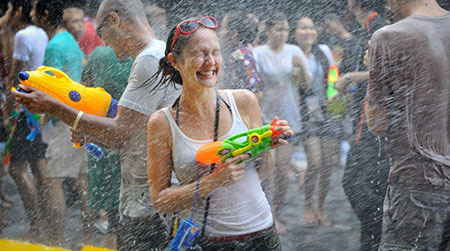 Songkran marks the starts of the new year in Thailand, and is celebrated with a water festival lasting over two days. Do not expect to venture outdoors without getting doused with water. Impish individuals, armed with water guns and buckets, are on a keen lookout for their next victims. Some stand tall from the back of trucks, drenching passerbys with ice-cold water. Apart from getting a good soak, expect to be soused in colours, for coloured talcum powder is sometimes used, turning passerbys into a riot of hues. If turning soakin’ wet is not quite your idea of fun, it is best not to put a single foot out of your room, and to remain indoors all day. 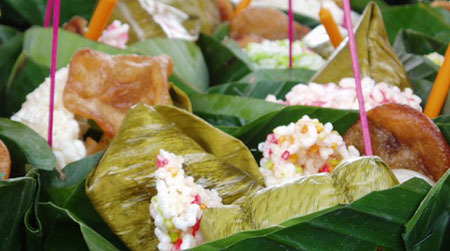 Loy means ‘to float’, and krathong refers to a floating object that is traditionally made from pieces cut out from the trunk of the banana tree. Loy Krathong is a festival celebrated annually on the night of the full moon, during twelfth month of the Thai lunar calendar. Traditionally, the festival is held for the purpose of making offerings to the spirits of the underwater world. Locals float out miniature boats, filled with coins and offerings into oceans, rivers and lakes. These days, this practice is still carried out by the Thais, although it is done more for fun than for religious purposes. During the festival, you will chance upon numerous stalls selling a variety of krathongs, ranging from those that are simply crafted, to elaborate versions that are much larger in size. Popular spots that the locals flock towards are Chaweng Lake and the Big Buddha Temple. Get camera-ready and arrive when the sky darkens. The serene lake, filled with a multitude of little boats with flickering candle lights, makes a pretty and picturesque sight. The Sart Festival is akin to a memorial day in Thailand whereby the dead are remembered and offered prayers. The celebration of this festival is very much influenced by Indian culture, as it is a Brahministic festival traditionally celebrated by the Indians. In Samui, offerings and rituals are held in Thai temples and Buddhist wats. One significant aspect of the festival is the preparation of a sweet dish, krayasat. Rice, sesame seeds, peanuts and sugar or honey are boiled to produce a sticky paste, which is wrapped up in a banana leaf. Krayasat is offered to the monks in temples, as well as to one’s relatives, friends and neighbours as a sign of respect. As with most traditional food items, the krayasat was a homemade treat prepared by members of the family; these days, it can be found in most markets and supermarts. Unlike the bullfights in Spain, buffalo fighting matches in Samui do not involve a man wielding a sword. Instead, the ‘fight’ occurs between two water buffaloes with their horns decorated with ribbons and gold-painted leaves. These matches are held on special celebrations, such as New Year’s Day and Songkran.